Pattern for paper piecing letters can be found at Kristy of Quiet Play's Craftsy store. The plan is to give it nice drape over the sides of the bed. I am going to use borders to do that and keep the fun designs for the top of the bed. The cupcake pattern was almost a bust, but I found a way to salvage it. As you can see, it started out as a paper piecing pattern. The icing part of the pattern gave me trouble when it came to putting the puzzle pieces of the pattern together. The seams were too thick and I was struggling, so I altered it and added my icing using appliqué. Just to be clear, the pattern was not the problem. I was. 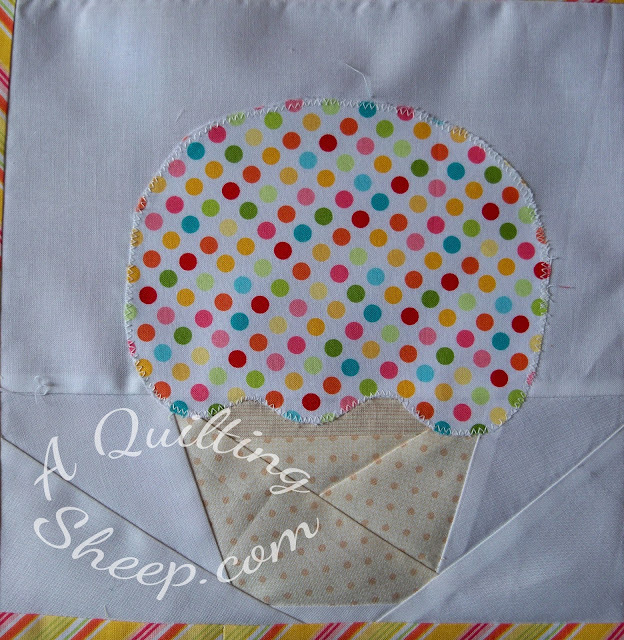 =) Here is the free paper piecing pattern for Yummy Cupcake. Oh my goodness! That is just the sweetest and cutest quilt...love it! Amy, it's adorable and getting cuter by the second!! Oh it's looking just fantastic!! What a beautiful quilt! It is just getting cuter and cuter! Can't wait to see more of the lovely rows you add to it! 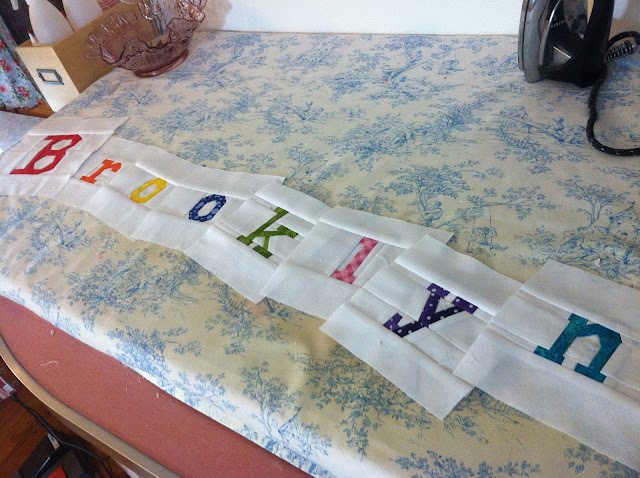 I thought the letters were darling on their own...but the quilt is just so beautiful! Ohhh now honestly... that has got to be the most adorable quilt I have ever seen. It's so adorable!! What a great quilt nd gift this is for Brooklyn!! Just lovely! What a beautiful quilt. She's truly blessed, in so many ways. Oh my, you are so creative. I wanna be your granddaughter. Love, love, love! I agree with Justmom1 that it keeps getting cuter and cuter! Wow! You are quick! This is great! I love that you combined paper piecing with applique. What a fun, pretty quilt this will be. Oh, yes ! You weren't kidding when you said you had come up with some projects to beat the winter blues ! That is going to be a one-of-a-king treasured keepsake for that granddaughter. I can't believe how cute that is! Hey! I used the blue cherry fabric for Odelia's 3rd birthday pajamas and the white cherry fabric for my friend's dishtowels! Great minds... ;) I LOVE Lakehouse fabrics. 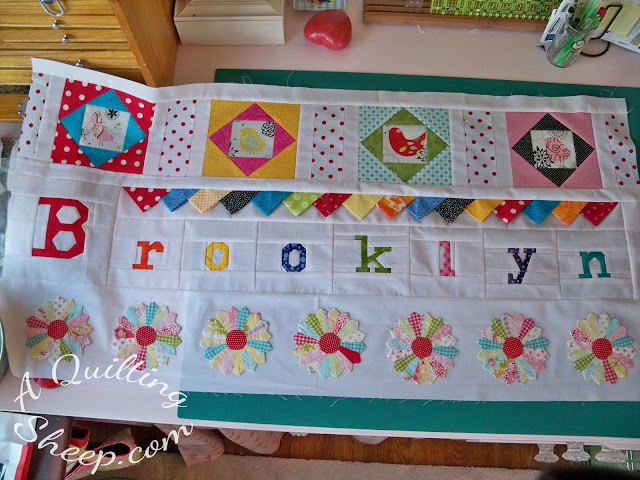 That is going to be such a grand quilt for lil' Brooklyn! I love all the variety pieces, the dresses and dresdens are perfect for a little girl. The bunting row is really creative, too. BeAuTiFuL!!!! Love it, love it, love it!!! Great job on the icing...it's just soooo cute! Looks FABulous Amy!!! 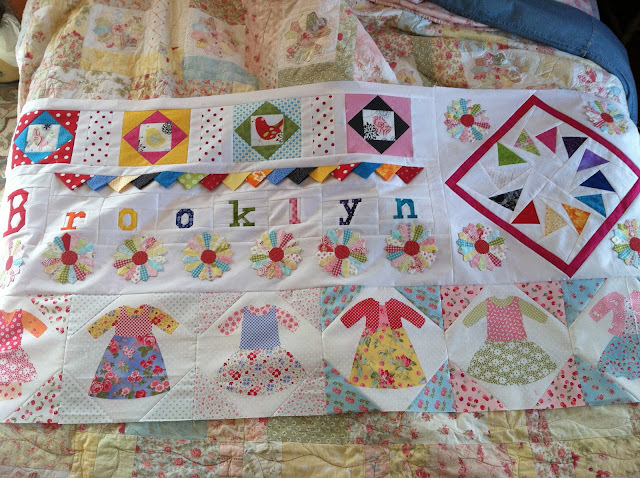 What a super special quilt for a little girl!!! Wonderful quilt with all the bright colors and patterns. Amy, could this quilt be any cuter? I think not! Love the colors and the design is so cute! Where did you find the little dress blocks? Is the banner your own design? Sooooo cute...I may have to copy for one of my girls...is that OK? Also, I was wondering, do you wash your quilts after you are finished? I am making that Moda Vintage Modern quilt for my own grand-daughter and was hoping I could wash it after to make it nice and soft for her. Is that a good idea? Will it run? All the best too you, Amy! Darling! Just DARLING! Sure to become a treasured quilt she'll use & keep forever! What a great way to show your love! This is so pretty! LOVE the little dresden plates! Beautiful work Amy. Amy, that quilt is so pretty. She will love it. I have just discovered your blog and your work is absolutely amazing. This quilt is gorgeous! well, look at you and all your creativeness! I just love it. Brooklyn will just love it. I finally got over to check this quilt out. Wow! Gasp! Yikes! 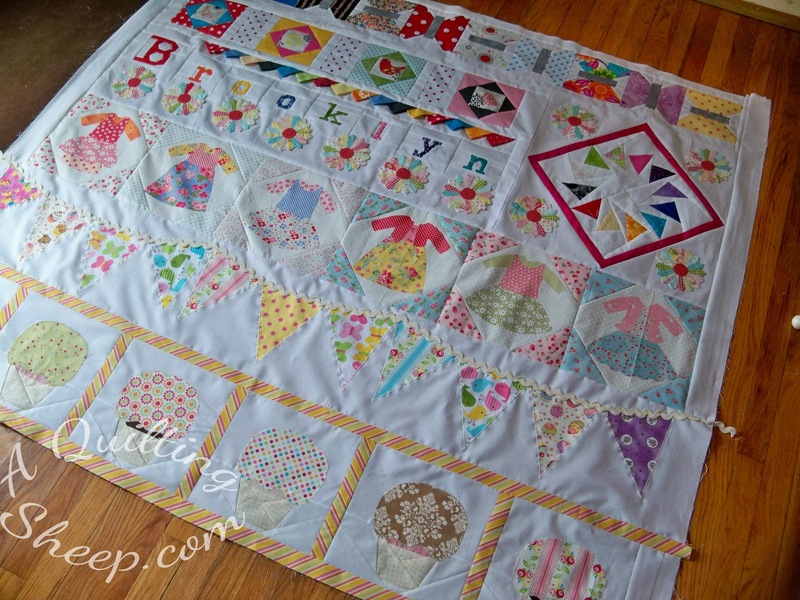 Now that is one creative, happy, cheerful, girlie quilt. And I love it. I hadn't seen the cupcake renditions on this until now. Everything fits together. Can't wait to see the finished quilt. I LOVE the quilt and have been looking for a good paper piecing alphabet and cupcake. Thanks for leading me to both! I gave you credit with Kristy when I purchased the alphabets. Hope you have a great day! Wow ! That is all I can say!! I love it!! I hope to get busy on MILLIE she will be 3 on the 30th....maybe it could be a for Christmas on for MILLIE and CORA and CAROLINE! it is perfect for little gals!! Thank you!! !